Well, that was fun for Portland while it lasted. The five-game win streak is over after losing to Dallas. So why is closing the book on a win-streak actually a good thing? It puts life out West in perspective for the Blazers. The last thing Portland needs right now is to rattle off 10-straight like the Boston Celtics, then have everyone gunning for them to fall on their faces. Forget that. The Blazers are better off flying under the radar and sneaking up on teams. That’s why they are sitting fourth out West in the first place. It’s not that Portland has to win every game. Certainly helps, but it isn’t a must. Because right now, the Blazers are sitting right where they want to be while teams around them are beginning to hit the skids. Tt’s more important to get and stay healthy than it is to win six, seven or eight games in a row. Wins will soon follow. Steve Blake is preparing to return after Portland’s current road trip – hopefully Martell Webster before too long. New Orleans has lost four-straight and will be without Chris Paul. Utah is banged up missing both Carlos Boozer and Andrei Kirilenko. The Los Angeles Lakers – while not immediately fazed by the loss of Andrew Bynum – is missing a cog in their machine. Houston is always a team with an injury waiting to happen. It’s too early for Portland to peak. The Latest: Hard too not think about the upcoming trade deadline these days. And what better way to get a debate going then talk about some players who should be on a general manager’s shortlist…..or at least a topic of converstation between a few front offices. Check out “10 Players GM’s Should Call About” over at HOOPSWORLD too see who made the cut. Change is a good thing. And on Sunday afternoon in Toronto the Portland Trail Blazers will begin to dabble in some minor alterations. Not only is Martell Webster suiting-up for the first time this season, but his return to action also creates a ripple effect throughout the rest of the roster. I addressed this recently at HOOPSWORLD but failed to include someone in the “Webster returns” equation: Ike Diogu. Diogu has barely sniffed the floor this season. Actually, I think you and I have played more minutes than Ike so far this year. Yet with Webster getting reacclimated with minutes here and there– briefly now and logically a lot later – perhaps this is the time for a change in whom – along with Travis Outlaw – helps back up LaMarcus Aldridge. Maybe it’s time to get Diogu in the fold before long? Portland has missed a rugged bruising forward since the days of Brian Grant. Channing Frye isn’t going to provide that presence anytime soon, and since it appears he’ll have his minutes cut the most with Webster back, why not see what Diogu can give you with more than mop-up minutes? I can hear Nate McMillan now: it depends on the match-up. Well, why not create a mismatch? Let the other coach adjust. At 6-9 and 250 pounds, all Ike would be expected to do is rebound and bang – you know, add a little toughness down low; an attribute many surely agree would be a welcomed change and shouldn’t be only expected of Joel Przybilla. Update: Apparently Nate has other plans….Diogu was placed on the inactive list to make room for Martell. It was a couple days before the Blazers embarked on their now complete five game road trip – a trip that saw them beat Orlando, Miami and Minnesota and fall to New Orleans and the Warriors. Roy leaned against a wall at the practice facility and put it perfectly. The man speaks the truth. Portland is still trying to figure out how to win on the road. Going 3-2 on a mid-November roadie is solid, but 4-1 would have beeen better, particularly on Tuesday night when the Blazers should have beat the Warriors. But winning on the road isn’t the only unsolved mystery. As I discussed today in a column called “Portland’s Missing ‘Identity’” running on HOOPSWORLD, it’s clear the Blazers are still trying to figure out who they are. Nate McMillan is still toying with rotations. It’s a constant shuffle depending on match-ups. Are they a fastbreak team? Are they a halfcourt team? Is Portland’s lack of “identity” (Kevin Pritchard’s word) simply due to the fact Martell Webster is on the shelf? Even still, there are some small victories you can take from the loss at Golden State…. Jerryd Bayless finally sniffed the court. After picking up a quick foul and turning the ball over, Bayless remained active and forced a steal himself. It may have only been a scoreless 3:54, but I’m thinking the confidence boost for the young rookie was timeless. Jerryd needed that playing time if not physically to stay loose and ready, than surely mentally. You don’t want to lose this kid. Greg Oden got his run on. Playing the Warriors is the perfect remedy to help get Oden in game shape and overcome any issues of conditioning. Even if Portland was outscored 22-9 on fastbreak points, the big fella was hustling. Oden played nearly 30 minutes and finished with 22 points – both career-highs. But the real treat –besides his signature dunks – was watching him run the floor and finish on a break with Travis Outlaw and Brandon Roy. More please. 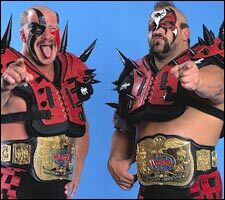 Let’s continue this “Road Warrior” theme (big up to Hawk and Animal)….